Published Apr 2008 by DC. 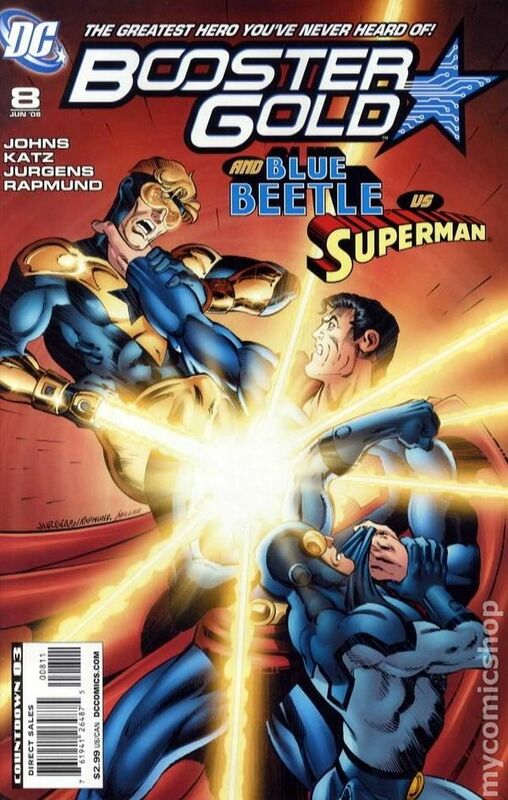 Blue and Gold: Part 1 of 6 - Written by Geoff Johns & Jeff Katz Art and cover by Dan Jurgens & Norm Rapmund. An issue over ten years in the making! An official ZERO HOUR crossover kicks off the second time-traveling story arc of 'the greatest hero the world will never know' with 'Blue and Gold,' Part 1! Witness the secret origin of Booster Gold as he journeys through the time line, lost, in an attempt to return home...with a good friend in tow. But there's an evil out there waiting for him; one of the greatest villains of the DC Universe: Hal Jordan, a.k.a. Parallax! Story continues in Booster Gold (2007 DC 2nd Series) #7. Cover price $2.99. Published May 2008 by DC. Blue and Gold: Part 2 of 6 - Written by Geoff Johns & Jeff Katz Art and cover by Dan Jurgens & Norm Rapmund Story continued from Booster Gold (2007 DC 2nd Series) #0. It's back to the present for Booster Gold! But history has changed, and not for the better. The new man in charge is Maxwell Lord, and his army of O.M.A.C.s won't stop until Booster is dead. Plus, the return of Supernova! ? 32 pg, FC Cover price $2.99. 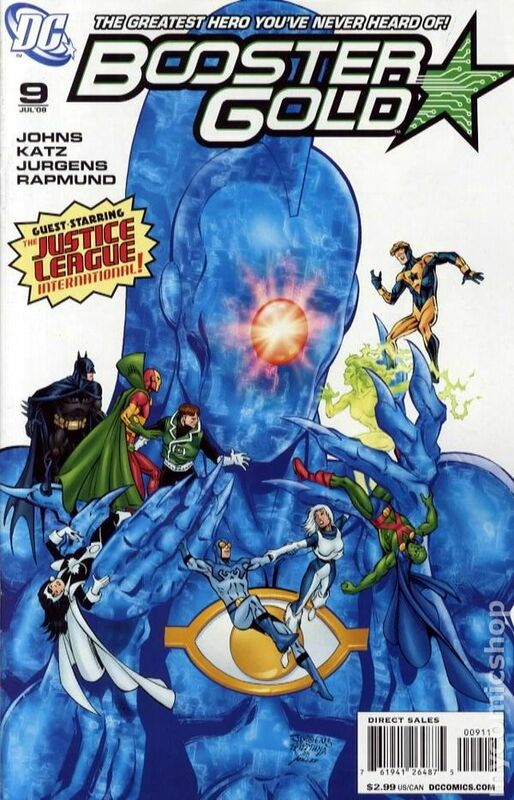 Blue and Gold: Part 3 of 6 - Written by Geoff Johns & Jeff Katz Art and cover by Dan Jurgens & Norm Rapmund Booster and Beetle come face-to-face with the all-new, all-different Freedom Fighters as time continues to crash down around them. Can a makeshift super-team really stop Maxwell Lord and his O.M.A.C.s? Plus, the continuing evil machinations of Supernova and Black Beetle! ? 32 pg, FC Cover price $2.99. Published Jul 2008 by DC. Blue and Gold: Part 4 of 6 - Written by Geoff Johns & Jeff Katz Art and cover by Dan Jurgens & Norm Rapmund 'Blue and Gold' continues as the Justice League International returns! 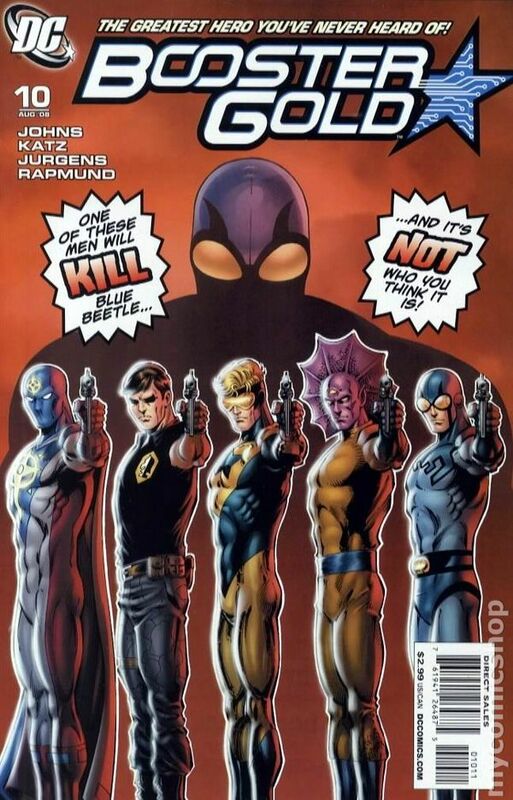 In a desperate attempt to correct time, Booster Gold and Blue Beetle are forced to rebuild the team that defined them so long ago! But can what's left of the JLI stop Max Lord and save the world from his O.M.A.C.s? ? 32 pg, FC Cover price $2.99. Published Aug 2008 by DC. 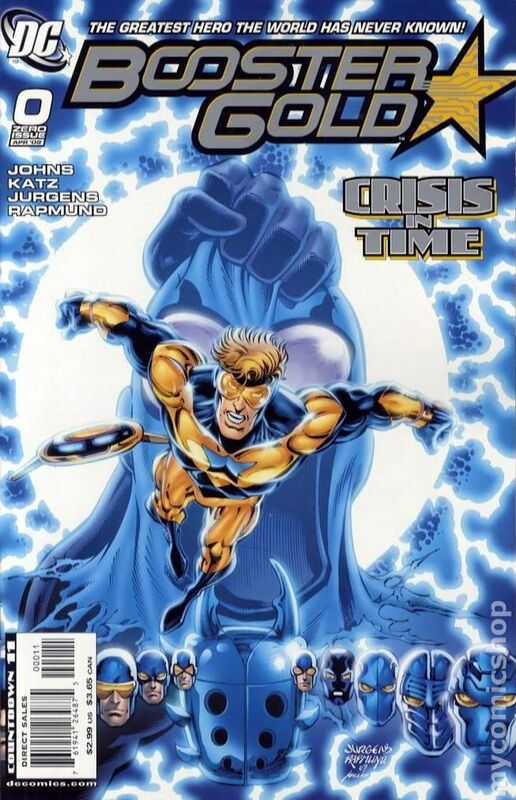 Blue and Gold: Part 5 of 6 - Written by Geoff Johns & Jeff Katz Art and cover by Dan Jurgens & Norm Rapmund In order to correct the past and save the future, Booster Gold faces a startling reality - someone from his past must live and someone must die! Can the greatest hero the world has never known do what must be done to save all of time? ? 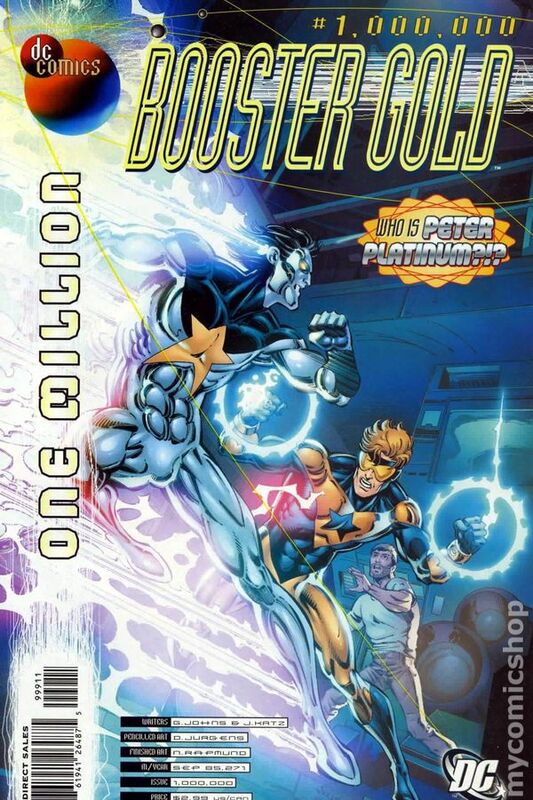 32 pg, FC NOTE: Story continues in Booster Gold (2007 DC 2nd Series) #1,000,000 Cover price $2.99. 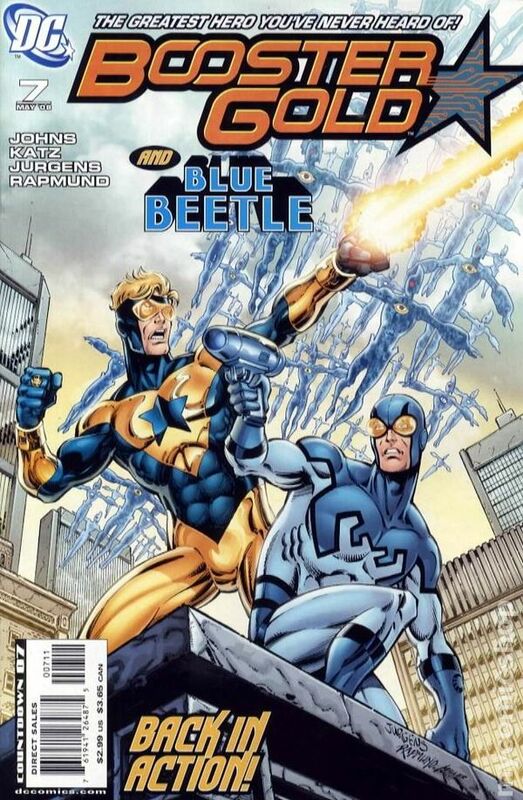 Blue & Gold: Part 6 of 6 - Story continued from Booster Gold (2007 DC 2nd Series) #10 - Written by Geoff Johns & Jeff Katz Art and cover by Dan Jurgens & Norm Rapmund Meet the greatest time-traveling hero of the year 1,000,000 A.D. - PETER PLATINUM! Lost in time, Booster Gold is confronted by a hero a million times more self-involved than himself. But if Booster does find his way back to the present, Batman will be waiting for him. ? 32 pg, FC Cover price $2.99.